Special Events - College Hockey, Inc.
From the season-opening Ice Breaker Tournament to the Frozen Four, college hockey features a variety of special events that put the schools and student-athletes in the spotlight throughout the season. 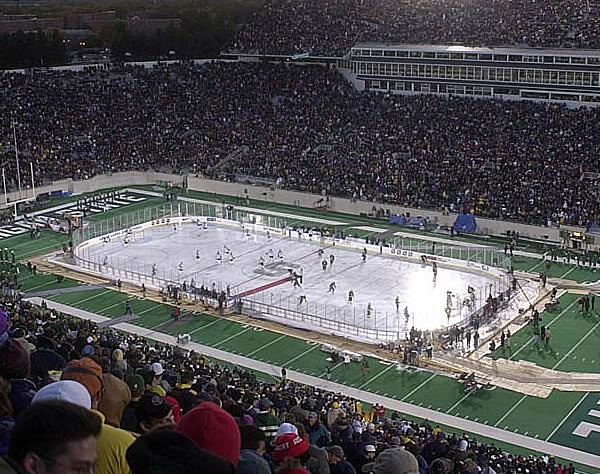 College hockey pioneered the modern outdoor hockey game with the 2001 "Cold War" (right) between Michigan State and Michigan. Those schools met again in the 2010 "Big Chill" at Michigan Stadium, attracting a crowd of 109,901, the most ever to watch a hockey game. Other programs to participate in outdoor games include Boston College, Boston University, Connecticut, Ohio State, Sacred Heart and Wisconsin. Other in-season events include the Beanpot (featuring four Boston schools at TD Garden), Red Hot Hockey between BU and Cornell at Madison Square Garden and a variety of annual holiday tournaments like the Great Lakes Invitational at Detroit's Joe Louis Arena. Traditional on-campus events like Rensselaer's Big Red Freakout! and Michigan Tech's Winter Carnival also highlight the schedule. Postseason schedules take teams to conference tournaments at a variety of neutral sites like Xcel Energy Center. The NCAA Tournament features 16 teams and begins with four regional sites and culminating at the Frozen Four. It was a great atmosphere for the kids to be in. I thought the whole tournament was tremendous. It's a phenomenal experience. I mean, this is one of the best venues you could have in this tournament, if not the best. It's a hockey city. It's a great building and a great atmosphere. What the Beanpot means to me? Quite simply, there are two words that come to mind: tradition and emotion. Anyone who has a pulse around here knows about the tradition of the Beanpot. I'm a local kid. I grew up in Scituate. I started coming to the Beanpot about the same time I started playing hockey. It was awesome. I just can't explain it. It was awesome. I blacked out. It was nuts -- just so much excitement.